East Texas' favorite "high place" is scheduled for a makeover this year with the goal of bringing back the popularity it enjoyed during the first half of the last century. 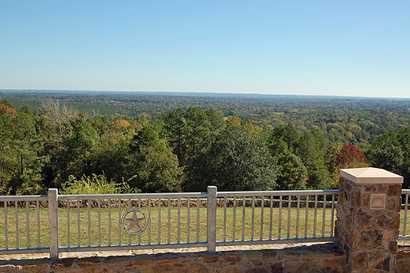 Perched atop a scenic forested ridge beside U.S. Highway 69 north of Jacksonville, Love's Lookout offers perhaps the grandest view in East Texas. Visitors can scan a horizon that stretches into several counties. Some are convinced that, on a clear day, they can see Louisiana. The ridge, part of a long, flat-topped hill that extends for nine miles, has an elevation of 720 feet above sea level and rises 240 feet above the surrounding terrain. 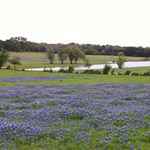 During antebellum Texas, the hilltop was a popular recreation spot for townspeople at Larissa, about three miles to the west. With the advent of the automobile, the site became popular for outings. President Franklin D. Roosevelt's Depression-era Works Progress Administration came to the hill in the 1930s and, using red rock mined from Cherokee County, built a park, picnic grounds and an amphitheater used for sunrise services, plays and other events. The park also had a popular swimming pool and a dance pavilion. During its heyday, it wasn't uncommon for families from as far away as Dallas and Houston to drive to Love's Lookout for a weekend picnic. The park's $1.2 million renovation project, a long-time goal of Cherokee County leaders, will include an improved roadside rest area and a new visitor's center designed to resemble a tomato packing shed, a symbol of Jacksonville's tomato-growing heritage. The renovation might help erase one of the old misconceptions about the hillside. Almost since its establishment, Love's Lookout visitors have always thought the name came from the use of the hilltop as a lovers' trysting place. After 1910, the bluff acquired its present name to honor Wesley Love of Jacksonville, who in 1904 bought much of the surrounding area and planted a 600-acre peach farm. After Love's death in 1925, his wife donated 22 acres to the state for a state park. The state, however, failed to create the park and in 1934 the City of Jacksonville purchased an additional 20 acres and developed the two tracts as a city park. That's when the Works Progress Administration stepped into the picture. There are two great times to visit the hilltop -- in the spring, when the dogwoods and other spring flowers are in bloom, and the autumn, when the hillside is ablaze with red, purple, yellow and golden foliage. * I just wanted to point out a mistake in the dates in your article about Love's Lookout. You state: In the 1980s, an earthquake -- one of the few to occur in East Texas -- damaged the amphitheater and made it unsafe for public use. 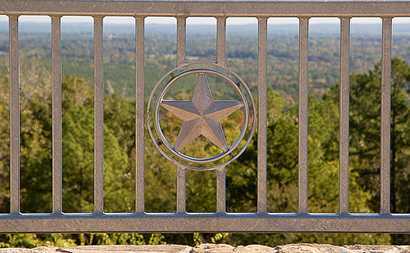 The Texas Forest Service also built on the hill a forest fire lookout tower that functioned into the 1980s until fire-spotting airplanes made the tower obsolete. The metal structure still stands on the hill, mostly as a historical relic, but park visitors are not permitted to climb its stairs. This is incorrect. I was raised down in the valley of Love's Lookout and I know first hand that the dates here are wrong. We moved there in 1976. My father was the pastor of a little church down the Lookout valley road that runes off the side of the mountain. It was called the Mt. Hope church of the Nazarene at that time, the name latter changed to Lookout Valley Church of the Nazarene. It is still there. There was an earth quake in the 80's but the amphitheater was gone well before that time. We use to play on the steps that remained. The amphitheater had to have been destroyed before 1975. As for the fire tower, it was not used when we moved there either. I know this because we climbed it on numerous occasions; although I would never climb it now.